Having kids is a messy job. They have stuff, and just when you thought they couldn’t possibly get any more stuff, they do. When you’ve ran out of cupboards under the stairs, the basement is full and the garage won’t even fit a bike in, let alone a car, it make be time to think about spring cleaning your life! These clever apps and services will help you get rid of anything you don’t need with ease, so you can make some extra cash and breathe a sigh of relief. Sometimes to give yourself the kick start you need to de-clutter your home, you need just a little bit of organisation. You might want to buy a whiteboard and make a little to-do list, but if you need something more why not turn to your iPhone or iPad. 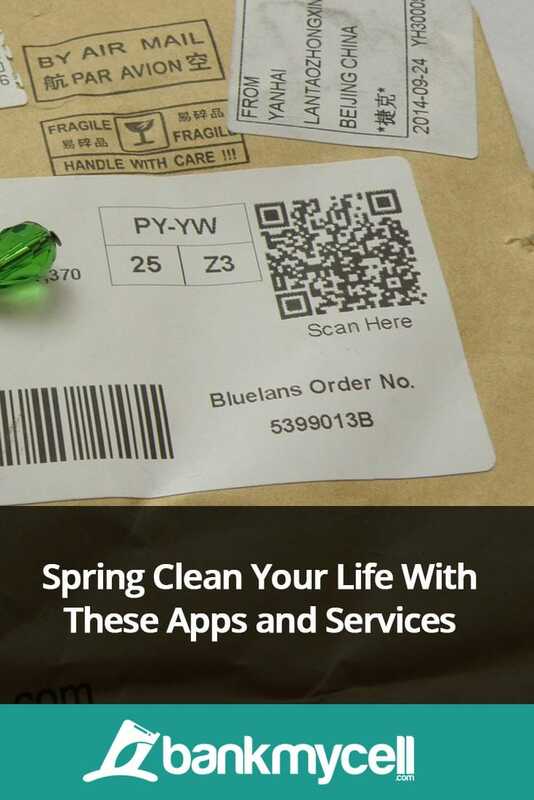 One app which is worth downloading is TidyLife. TidyLife claims to offer you a ‘smarter checklist’’. Not only does it offer you a platform to create checklists for both discarding and reorganizing, but it will motivate you along the way and even offer advice. For example it suggests that you only keep clothing that makes you feel good. Brightnest.com is an American site which is bursting full of amazing suggestions like ’10 of the best spring cleaning tips ever’ and ‘how to repair chipped mugs easily’. Whatever you need, you’ll likely find it here. The site asks you to sign up, where you will need to tell them a bit about your home (what sort of climate you live in, what sort of tips you need, if your house has a garage etc.) Once you have created an account, you can save tips for later tick of completed task lists, and schedule a time frame for specific projects. You can also download the app on Android and Apple devices for free so you can access your lists wherever. This place will basically both organize and inspire you! It’s worth a nose around. When going through the kids boxes of junk they don’t use, you’re probably going to come across some junk of your own. If you find any unused phones, tablets, Sat Navs, iPods or games consoles, you’ve hit gold. You can sell old tech for a guaranteed good price (depending on how old and battered it is). Plus by getting rid of old gadgets you’re doing your bit for the planet, and freeing up some much needed draw space. Selling old gadgets can be done on ebay or Craigslist, but one of the easiest way to do it is through a gadget recycling company. Use a comparison site to find the best prices for your device. Comparison sites like this will browse the market for you and show you a whole range of prices on offer. Pick your favorite and use their FREE shipping kits to send off your tech. Most places will then pay you via check, PayPal or direct bank transfer. You can sell old clothes, or you can get that feel-good feeling and give them to charity. Obviously you can pop them in a bin bag and take them down to your local shop, but if you’re short on time then Clothes for Charity will come and collect them fro! All you need to do is log into the site, find your chosen charity and request a bag. They will post it to you along with a barcode and exactly what to do next. Fill it with your old clothes, shoes and accessories (which are in good condition), then log in and arrange a collection! Believe it or not you can actually sell all that old Lego online really easily! Zapper will let you sell pretty much any Lego you have lying around, all you need to do is weigh it in a plastic bag and select a free delivery option. You can get up to $35 for 10KG of Lego! Which is better than leaving it gathering dust, or even worse waiting for someone to step on it. If you have rarer Lego items, like sets or mini figurines, then you can explore BrickLink. BrickLink is a specialist Lego selling site. All you need to do is verify your items with them and add it to sell. Seller sites like eBay will put you entirely in charge of the price and process of your sale. All you need to do is take pictures of anything you want to sell and list them for a small fee. eBay is an especially good option if you are selling anything like prams, designer clothing and in-demand toys. Some top tips: research your shipping cost. Craigslist and Gumtree are another great way to sell your unwanted stuff, and could save you the hassle of postage – ideal if you work full time plus have to get the kids to school. The site will advertise your item to people who are local, so you can either arrange pick-up or you can deliver it yourself. Craigslist and Gumtree are great places to sell things like kid’s car seats, old furniture, toys and bikes which are too small now. While you’re selling, it is also a great place to look for anything you might actually need… but don’t get carried away, make sure whatever you get it is absolutely essential! In a world where land sites are filling, Freecycle aims to offer a ‘worldwide sharing mission’, where anyone can post stuff for free online which might be of use to their community. It reduces waste and saves resources. Plus it helps out those who could actually do with a bike. All you do is log-in or sign up, and list anything you can’t be bothered to sell but want to get rid of. Take a look through what is on offer. People use the site to get rid of chairs, mattresses, old CD covers, roses, fairy toadstools – you name it, it’s probably on there. It’s simple to use and allows you to get rid and give back. Freecycle is perfect if you have a sack of baby grows you know you won’t sell, but could give away as a bundle. Get the kids involved with this one and organize a front garden jumble sale. By making a game out of it, your kids might even want to sell a few more of their toys that they still play with but not very often. Get everything you want to sell into a pile, and pick carefully! Ask yourself key questions like “are they too old for that now?” “When was the last time I/ they wore that?”. Sort everything into piles depending on type, then pick a date. It is best to go for something at the beginning of the month so it’s close to payday! Advertise it on social media, or even just a few fliers down the street! Before you start the event, you may want to give your front garden a quick tidy and make a killer sign! This is another fun activity for the kids. Then sit back and watch the customers pour in. Remember, you might not make a fortune from this, but be clear on anything you know is worth a lot of money, and let the kids enjoy themselves. Facebook has become a fantastic way to sell your stuff and interact with buyers directly. You can use local selling groups in your neighbourhood or city to advertise whatever you want to sell and negotiate a price with whoever is interested. To find a local selling group, simply use the Facebook search tool and type in your post code along with words like ‘sell’, ‘selling’ or ‘buy’. Once you’ve found a few groups click ‘join group’ and wait for the administrator to accept you. Make sure you upload good quality images to persuade people to buy whatever you’re selling, it could be the difference between loads of interest and none at all! Dust and polish anything you are selling, set it up in a nice bright clean spot and take some quality photos! Nobody will want to pay good money for a chair they can’t see, or one which looks old and tattered. Once you’ve received an offer you like the look of, take a look at the buyers profile and check they seem legit. If not you can simply sell them you’ve had a better offer. If they seem fine, then private message them so you can arrange how you are going to do the exchange. When you’ve sold your item, pop a ‘sold’ comment on your post so people don’t keep inquiring. If it doesn’t sell, try another group or turn to one of the other methods above! Let me know if you have any tips / questions / feedback by leaving a quick comment below right now!